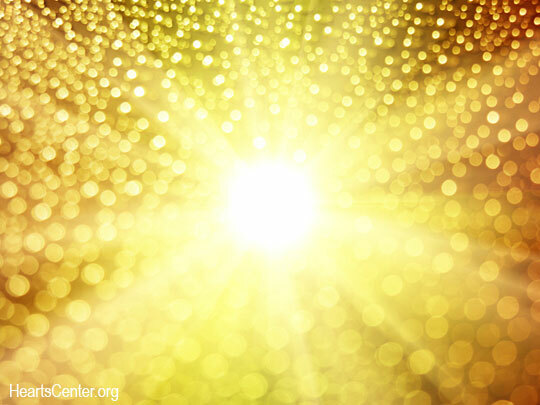 Image: A golden sun with golden orbs around it … http://www.heartscenter.org/Portals/0/xBlog/uploads/2014/11/13/golden-aura_540x405.jpg .. The 6th chakra, the ‘third-eye point’, is located in inside the head at a level as high as the eyebrows. Physically, it corresponds to the pituitary gland, which is very important to our body’s functions. So it is good to keep these energies balanced and pure. The 7th chakra, the ‘crown chakra’, is related to the pineal gland, a gland that exists inside the head at the level of the mid-forehead, above and behind the pituitary gland, from which it is separated by the hypothalamus and thalamus. This chakra is a gateway to the higher realms; perhaps for this reason it is sometimes termed the ‘Seat of the Soul’. The pineal gland must be kept clear and healthy so that we can keep in touch with our Higher Self, with our Ascension Team, and with our own God consciousness. Yogic lore has sometimes confused these two chakras, and inaccurately termed both the ‘third-eye point’. Thus, in images, we sometimes see the ‘third-eye point’ depicted between the eyebrows, and sometimes at mid-forehead. However, these are two separate chakras, and correspond to two separate locations inside the head. Whether the lore can be set right on this is a moot point, because of the diversity of schools of yoga. Link: “Figure 5-46. The Crystal Palace,” http://www.wellthychoices.net/wp-content/uploads/2012/11/the-crystal-palace.jpg ..
Link: “Great Pyramid of Cheops in Giza,” from Wikipedia, https://fr.wikipedia.org/wiki/Fichier:Kheops-coupe.svg .. 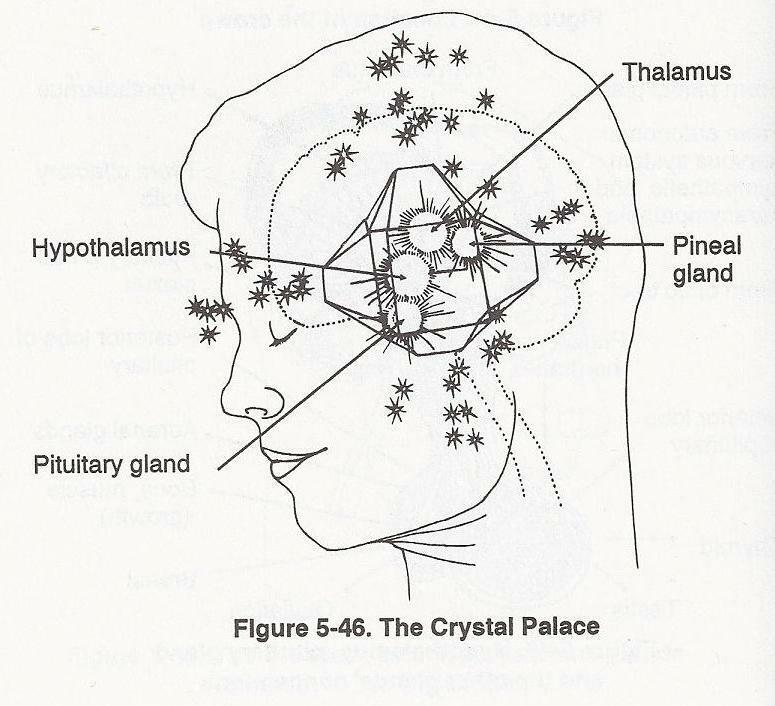 Image: “Artwork by Gary Osbourne,” 1999 … http://www.healingenergytools.com/wp-content/uploads/2015/01/Pineal-pyramid.jpg .. In kundalini yoga as taught by Yogi Bhajan, I have seen reference to a ‘golden cord’ of energy that radiates from the pineal gland in the direction of the pituitary gland when the kundalini energy is activated. Imagine that line of energy in the above artwork. 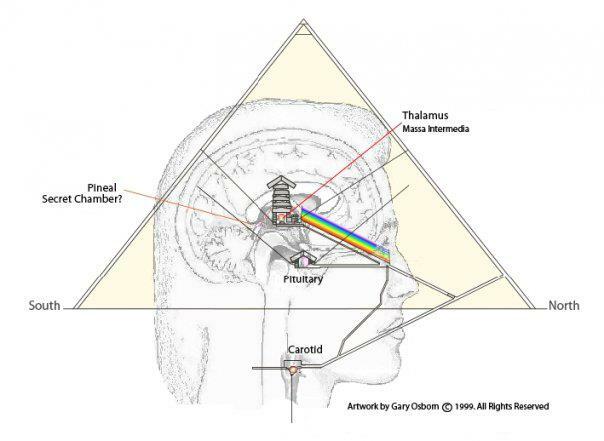 See how the ‘golden cord’ forms a triangle with the rainbow line between the eyes and the pineal (Secret Chamber) and with the line from the eyes to the pituitary gland? So there we have what is termed a ‘right’ triangle. Intuition tells me that, when we meditate, the level at which we place our gaze determines which of these two glands … the pituitary gland or the pineal gland … is activated. Link: “To Clear a Black Magic Spell from the Third-Eye Point,” by Alice B. Clagett, 24 March 2017 … https://wp.me/p2Rkym-751 ..
Link: “Human Electric Field and Magnetic Force,” by Alice B. Clagett, 8 September 2016, https://wp.me/p2Rkym-64T ..
Video: Kundalini Yoga for Memory and Magnetism with Akasha and Jai-Jagdeesh,” by Spirit Voyage, 11 July 2012 … https://www.youtube.com/watch?v=CMsrMWrH610&list=PLJQlIlMq_jzpeM58wBJmnyLz43HK1fOXO ..
Link: “Kundalini Yoga for Balancing the Pineal, Pituitary and Hypothalamus,” from “Owners Manual for the Human Body … https://www.pinklotus.org/-%20KY%20Kriya%20for%20balancing%20the%20Pineal,%20Pituitary%20and%20Hypothalamus.htm ..
Link: “How to Decalcify the Pineal Gland (Third Eye/Ajna Chakra)?” … http://decalcifypinealgland.com/how-to-decalcify-the-pineal-gland/ ..
Video: “Pineal Gland Activation ~ Brainwave Binaural Beat Full Length HD Meditation,” by Source Vibrations, 5 February 2013 … https://www.youtube.com/watch?v=aq8RA0LGoZE ..
Link “Dealing with the Disincarnate Gods,” by Alice B. Clagett, 10 May 2015 … http://wp.me/p2Rkym-5g1 ..
Optimizing the health of the pituitary gland and the pineal gland, and balancing and clearing the third-eye point and the crown chakra are of primary importance in aligning our will and our action in the world with the Will of God, rather than that of the disincarnate gods, the jinn, the Demon Hordes, and the like, which though little known and little mulled over in the Western world, do apparently exist on Earth. Thankfully, we find the jinn mostly in desert regions. The Demon Hordes prefer the cities of Earth. And the disincarnate gods, though relatively few in number, are peskily omnipresent, omniscient, and omnipotent, in the context of causal reality (the Time and Space in which people feel used to feel ‘stuck’ prior to the attainment of multidimensional and multitemporal skills, which happened for many people during the 2012 Shift. So then, the trick is to avoid the ‘sticky wickets’ and stay in tune with our Ascension Team, the Angelic Realm, and the Great Will, the Great Heart, and the Great Mind of God. This is not, I feel, that easy, here on Earth; optimization of the 6th and 7th chakras being essential to this task. This entry was posted in 6th chakra - third-eye point, 7th chakra - crown chakra, Aligning with God - dharma - right action, Angelic realm, Ascension team, Demon Hordes, Demonic realm, Diet - herbs - extracts - aromatherapy, Dimensions - multidimensionality - veils, Disincarnate gods - omnipresence, Jinn - ifrit - genies, Meditations - visualizations, Timelines - multitemporality - alternate universes - fractals, Yoga and tagged 6th chakra, 7th chakra, aligning with God, Angelic realm, ascension team, crown chakra, Demon Hordes, demon realm, diet, Diet - herbs - extracts - aromatherapy, disincarnate gods, djinn, healing, jinn, JScambio, meditations, multidimensionality, multitemporality, pineal gland, pituitary gland, Shift, third eye, third eye-point, Yoga on 12 June 2015 by Alice B. Clagett.